Start by air-sealing the walls and weatherstripping exterior doors. These two upgrades cost far less than insulating walls, but can still make a significant impact on home energy efficiency. Blow insulation into wall cavities. 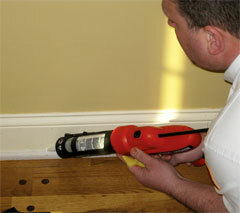 It’s possible to drill access holes near the top of a wall and blow insulation into wall cavities. Holes are typically drilled from outside. Once the insulation is installed, the holes are plugged as inconspicuously as possible. Insulate walls when you’re replacing exterior siding. If the siding on the house is in bad shape and will need to be replaced soon, insulation can be added after the old siding is removed. The U.S. DOE states on their web site that properly insulated exterior walls in your house will not only increase comfort but also help you save on heating and cooling costs. For energy savings, you can add insulation to your walls in an existing house. Before insulating your walls, you should ensure that they’re properly air sealed. Moisture control is another consideration.